Suture is the main means of approximating tissues and devices. They range from resorbable to non-resorbable types both in natural and synthetic kinds. These are FDA class III medical devices used as a wound closure or tissue anastomosis. A recent advancement in the suture technology is a knot-less barbed suture. Vascular grafts are used to bypass or completely remove a diseased part of an artery. Thus the normal blood flow within the blood vessels is restored. These are FDA class III medical devices used as a permanent implant. 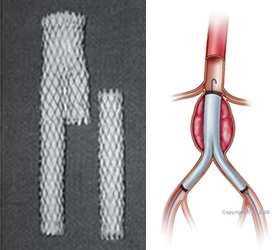 The endovascular stent graft is a medical device in which the stent is attached to the tubular fabric structure by sutures. It is used in treating AAA (Abdominal Aortic Aneurysms) These are FDA class III medical devices used as a permanent implant. 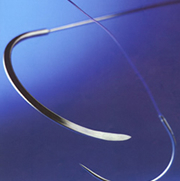 A stent is a made by cutting a thin tube of metal by machines. The metal is generally nitinol, which is a corrosion resistant material in the bloody environment inside the arteries. 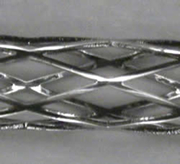 Stent is a made by cutting a thin tube of metal by machines. These are FDA class III medical devices used as a permanent implant. 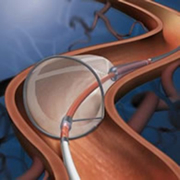 An Embolic Protection Device filters out the dangerous floating debris in the blood stream. This debris may consists of blood clot and plaque detached from the vessel wall or air bubble. Trapping and removal of such debris avoids blockage of vessels. These are FDA class III medical devices used as a temporary implant during and after cardiovascular surgery. Hernia repair mesh is primarily made from polyester. It may have a polyurethane backing. These are FDA class III medical devices used as a permanent implant.